LUANDA, May 27 2009 (IPS) - The flood waters are starting to recede as the rainy season ends for another year, but while the emergency is over in southern Angola, the long term outlook is bleak. Because of the water damage, many families have been unable to return to their villages and tens of thousands are clustered in IDP camps where there is a high risk of an outbreak of water-borne diseases due to pressures on sanitation. An increase in respiratory problems is also likely, particularly among children, as the country enters its “cacimbo” cool season. More than 222,000 families were displaced by heavy rains and flooding which swept away houses, sank roads, ruined 228,000 hectares of crops and killed thousands of goats, cows and livestock. 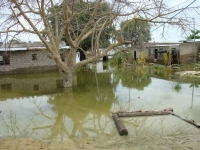 The provinces of Cunene and Kuando Kubango on Angola’s southern border with Namibia, and Moxico in the east next to Zambia, bore the brunt of the water damage. It is to these provinces that teams from the British Red Cross and the World Food Programme (WFP) have now been despatched to assess the seriousness of the situation and the threat posed to food security in Angola’s poorest provinces. The challenges are vast: communities living in traditional family structures in remote areas, hundreds of kilometres from towns and relying mainly on subsistence farming now need food and need it fast. Cunene, which also has the country’s highest prevalence of HIV – 10 percent compared to 2.1 percent nationally because of its proximity to the border with Namibia where the disease is more widespread – is where the food insecurity risks are highest. Karen Hvid, Angola representative of the International Federation of the Red Cross (IFRC), told IPS: “May and June are traditionally harvest months but this year the harvest will yield little because the flooding damaged 60 percent of agricultural land. “Even the crops on higher ground which escaped the flooding suffered from a lack of sunshine and rain and wind damage. “This is the fourth year in a row with a compromised harvest, the second year of flooding, which comes after two years of drought. According to Dom Fernando Kevano, the Bishop of Ondjiva, the humanitarian situation is extremely difficult and many families are trying to cross the southern border into Namibia to find food. “Many families are having to live in tents and the movement within the interior of the province continues to be restricted,” he said. During the worst of the rains, Angolan military helicopters and boats had to be drafted in to rescue the thousands cut off by the water. Countrywide more than 70 people died, most from drowning, but some were crushed in collapsed buildings, others electrocuted and a number of children were taken by crocodiles. The relief effort was led by the Angolan Government, working in partnership with, among others, IOM (International Organisation of Migration), CRS (Catholic Relief Service), USAID (United States Agency for International Development), UNICEF (The United Nations Children’s Fund) and the Angolan Red Cross. International and local funding appeals were launched and the UN’s Central Emergency Response Fund (CERF) provided 2.3 million dollars for the recovery. The emergency money has been spent on providing shelters, health kits, blankets and other basic items. The Ministry of Agriculture responded by providing 1,000 tons of millet and UNICEF despatched a shipment of 84 tons of plumpy nut, a supplement used to treat severe malnutrition. In the coming weeks the WFP and Red Cross teams will be carrying out evaluation studies in the worst-hit areas to assess the full extent of the rain damage to crops and livestock and make assessment on the food security situation. She added: “We also want to help families meet their social and cultural needs. Sometimes after a disaster people can adopt damaging coping mechanisms. The Angolan Government’s Commission for Civil Protection is also working with the UN and OCHA (Office for the Coordination of Humanitarian Affairs) to help establish a national contingency and strategic disaster plan. Hvid said: “The Government is extremely committed to this and they are co-ordinating all the relevant ministries. “One aspect that is extremely important is enhancing people’s knowledge about selecting safer ground to build their homes one. Angola’s heavy rain began late February and in three weeks as much rain fell as it would normally do during the whole rainy season of December to April. Water poured down from the country’s central highlands collecting in the southern flats. This caused flooding among the Cuvelai Basin and the dyke protecting the provincial capital Ondjiva, home to around 60,000 people could not withstand the pressure and cracked. As part of their plan to support the affected families and avoid a repeat of this scale of flooding next year, the Angolan Government announced this week it has created a special committee to focus on the problems in the Cuvelai Basin. The idea is to help the displaced in the short term but also bring in technical experts to study the rivers and water sources in the province which led to the flooding. The impact climate change has had on the additional rainfall in this part of Africa is yet to be fully investigated but the extent and severity of the flooding in Angola and across the borders in Namibia and Zambia certainly caught the authorities off-guard. According the UNDP (United Nations Development Programme) the Chobe, Zambezi and Okavango rivers reached water levels not recorded since 1963. In Namibia more than 100 people were killed, 55,000 displaced and more than 350,000 lost their livelihoods. For these victims and those to the north in Angola, whatever caused the floods, they have a long wait until the next harvest.